This is a list of major camera shops in Japan’s major cities. Yodobashi and BIC Camera are the largest camera chain stores. Most of the websites provide a map of the store’s location. Besides brick and mortar stores, we can buy camera equipment online at Amazon Japan and Yahoo Japan Auctions. For used camera stores in Tokyo, see this list. Also see the PhotoVendors FAQ. Remarks: Besides cameras, household appliances and sports equipment also sold. Remarks: Near Shibuya Station’s Hachiko (the dog) Exit. Remarks: On the corner near Shibuya Station’s East Exit. Remarks: Right near JR Shinjuku Station’s West Exit. Huge store occupying 5 floors along with Bic P kan which is a computer store. It shares the same building as Odakyu HALC. Excellent selection of camera equipment, studio equipment, and personal computer equipment. Remarks: In front of JR Yurakucho Station. Occupies the building that was the Sogo Dept. Store. Remarks: Gin-ichi is geared for professionals. Remarks: Huge branch of Tokyo’s favorite camera store. Right in front of JR Akihabara Station. The building also contains a bookstore (Yurindo), music shop (Tower Records), and restaurants which close at 11 pm. Remarks: Full-fledged camera and computer store. Right in the station building at JR Kinshicho Station (Sobu Line) South exit. Occupies the 1st, 2nd, and 3rd floors. Remarks: Right outside JR Machida Station South exit. Remarks: This store is right near the East exit of JR Shinjuku Station. A convenient place to pick up film before boarding the train. Note that there is a bigger store (Higashi-guchi Branch) slightly farther away. Remarks: Large camera store in Tokyo. Near this main store, you can also find other Yodobashi specialty shops such as for computers (Multimedia-kan), televisions (Terebi-kan), video games (Game/Music-kan), watches (Tokei Sogo-kan), and audio-visual equipment (AV Sogo-kan). Near JR Shinjuku Station West Exit (Nishi-guchi). Remarks: Full-fledged camera store. Near JR Ueno Station. Remarks: Near JR Yokohama Station. Yodobashi also has stores in Kichijoji, Hachioji, Machida, Kawasaki (Kanagawa), Kamiooka (Yokohama), Chiba, and Utsunomiya (Tochigi). Remarks: Near Namba Station and Nipponbashi Station. Remarks: Near Shinsaibashi Station (Midosuji subway line) Exit 5 and 6. Main store of this chain store. Hours: 10:00 – 18:30 (till 18:00 on Sun. ), closed Sun. Remarks: Used and new camera equipment. Near Shinsaibashi Station and Yotsubashi Station. Remarks: New and used camera equipment. Remarks: Used camera equipment near Umeda Station. 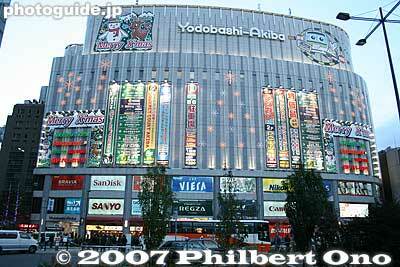 Remarks: Yodobashi’s big Osaka store is right near JR Osaka Station and Hankyu Umeda Station. Hours: 10:00-18:30, closed Sat., Sun. Remarks: Classic cameras. Mail order only. Remarks: Yodobashi’s big Kyoto store is next to Kyoto Tower near JR Kyoto Station. Hours: 9:30-19:30, closed Tue., Sat. Remarks: New and used camera equipment. Also repairs cameras. Near Yabacho subway station, Exit 5. Walk on the right for 100 meters, and see the yellow building. Remarks: Connected to the west side of JR Nagoya Station. Bic’s third largest store in Japan. Opened on Nov. 7, 2003. Remarks: Large store stocking new and used camera equipment. Accepts trade-ins for new equipment. Duty-free shopping too. Near Sakae Station (Higashiyama subway line), Exit 6. Branch store in Osu 3-30-86 (Daiichi Ameyoko Bldg.). Remarks: Near JR Sapporo Station. Remarks: Next to JR Koriyama Station West exit. Remarks: Near JR Sapporo Station North exit in Hokkaido. Remarks: Right outside JR Sendai Station East Exit. Remarks: In the JR Niigata Station building South exit. Remarks: Near JR Hakata Station Chikushi exit. This is a list of used camera shops in Tokyo area (including Chiba and Kanagawa Prefectures) of Japan. In alphabetical order. Note that “used cameras” can also mean “classic cameras” aimed at collectors. Many of these shops also have an online store. Few of them can communicate in English, and they might not ship overseas. Besides these brick and mortar stores, we can buy used camera equipment online at Yahoo Japan Auctions. Tokyo has an association of used camera shops called I.C.S. (Imported Camera Society) and you can view a Japanese list of member shops with maps. They also hold used camera fairs in Tokyo three times a year in Feb. (Matsuzaka Dept. Store in Ginza), May (Tokyu in Shibuya), and Oct. (Yurakucho). Many member shops gather to sell and show their wares at this fair. See the camera fair schedule here. Also see the PhotoVendors FAQ. Remarks: Near Iriya Station (no longer in Akasaka). 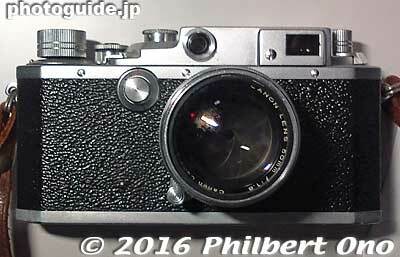 Large selection of used Japanese and imported cameras and lenses, mainly rangefinder and collectables. Only a small collection of recent film SLRs. Remarks: An impressive range of modern and collectable cameras at reasonable prices. If you are into manual focus 35mm then this is a good place to look. 35mm, medium/large format, digital. Near JR Akihabara Station (Yamanote Line) and Iwamotocho Station. Remarks: Classic cameras, used cameras, and accessories. Remarks: Classic camera and collectables specialty store with about 300 items to choose from, includes medium format and 35mm equipment. Near JR Ueno Station (Yamanote Line). Remarks: Mail order camera shop sells a fine collection of collectable classics. No brick and mortar store. Address: Ginza 5-15-1 Nankai Tokyo Bldg. Hours: 8:00-19:00, Sat. 9:00-18:00, closed Sun. Remarks: A premium collection of classic film and 8mm movie cameras. Warranty: 3 months on selected items. 35mm, medium format. Near Shinjuku Station. Remarks: New and used classic cameras (mainly Leica, Minox, Hassy, Linhof and Rollei). Warranty: 6 months on items over 30,000 yen. 35mm, medium/large format. Near Mitsukoshi-mae Station (Ginza Subway Line). Remarks: Large and popular (mainly among foreigners) store with many Japanese (especially Nikon) and imported brands. Sells both new and used equipment. Near JR Nakano Station (Chuo Line) North Exit. Hours: Tue-Fri: 12:30-17:00, Sat: 11:30-19:00, closed Mon. Remarks: Voigtlander specialty sales and classic camera repair store. Warranty: 6 months on selected items. 35mm and medium format. Near Asakusa Station (Ginza Subway Line). Hours: Tue.-Fri. 11:00-20:30, Sat./Sun. 10:00-18:00, closed Mon. Remarks: Large selection (over 1000 cameras and 3000 lenses) of sorts of used cameras and lenses. A collector’s dream store. Warranty: 6 months on selected items. 35mm, medium format. Near Asakusa Station (Ginza Subway Line). Remarks: Used cameras and accessories. It also offers to sell your used equipment at a favorable price. Lemon also has other branch stores in Shinjuku, Akihabara, Nagoya, and Osaka. Remarks: Near Shinjuku Sanchome Station (moved to this location in Nov. 2013). Buy, sell, and trade cameras. Leica specialist. Map in English provided on their website. Remarks: There are two large stores. The No. 1 store sells used equipment (both Japanese and imported cameras), and the adjacent No. 2 store sells digital cameras. Near Shinjuku Station West Exit. Very close to Yodobashi. Remarks: Used camera equipment. Near Ginza Station. Branch stores in Shinjuku (03-3356-1841) and Omiya (048-643-3316). Address: Jingumae 6-13-11 NP Bldg. Remarks: Sells a wide selection of professional film and digital photographic equipment. Also sells collectables and used pro studio cameras. 35mm, medium/large format. Near Meiji Jingumae Station (Chiyoda Subway Line). Remarks: An interesting selection of cameras and top-quality lenses. A good place to visit if you make a trip to Fujiya Camera. Warranty: 6-12 months. 35mm and digital. Near JR Nakano Station (Chuo Line). Remarks: New and used camera equipment of all major brands. Near JR Sakuragicho Station and Hinode-cho Station (Keihin Kyuko). Remarks: Mainly stock manual focus 35mm cameras and lenses. Also repairs cameras. Near JR Ebisu Station (Yamanote Line) west exit. Hours: 10:00-19:00 (till 18:30 on Sat. ), 11:00-18:00 on national holidays., closed Sun. Remarks: Good selection of cameras at competitive prices. Often featured in Japanese camera magazines. 35mm, medium format, digital. Near Gakugei Daigaku Station (Tokyu Toyoko Line). Remarks: This store deals in 35mm to large-format cameras. They also repair cameras. The store used to be in Shimbashi. 5-min. walk from the north exit of JR Okachimachi Station or 3 min. from Naka-Okachimachi Station on the Hibiya subway line. Remarks: Buys and sells vintage cameras (Leica, Hasselblad, Rollei, Ｃｏｎｔａｘ, Nikon) and watches (Patek Philippe, Vacheron Constantin, Audemars Piguet, Rolex, Iwc, Cartier, Omega). Near Ueno Station. Remarks: Store that sells props, lighting and cameras for pro studio work. Medium/large format. Duty-free too. Near Kayabacho Station (Hibiya/Tozai Subway Line). 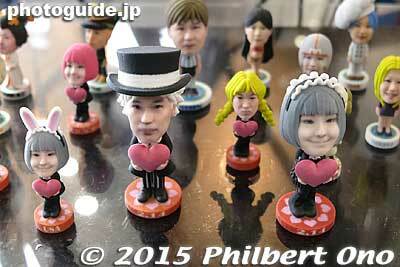 *Compiled by Philbert Ono with the kind assistance of former Japan resident and photographer Andrew Beveridge. List of photo exhibition venues and camera museums in Japan according to prefecture in alphabetical order. These galleries and museums are dedicated mainly to photography or they hold a photo exhibition on a regular basis. Most do not have information in English. Prefecture names are linked to Google Maps. Also read the PhotoSpaces FAQ. Canon Gallery Nagoya キヤノンギャラリー名古屋 Map – Near Fushimi Station, Exit 10. 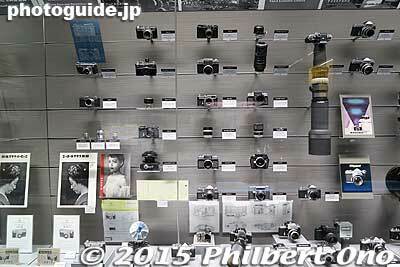 Fujifilm Photo Salon Fukuoka 富士フイルムフォトサロン福岡 Map – Established in Oct. 1974. Total wall length 41 meters. This is a free space for amateur and pro photographers. Applicants must pass a screening. 10-min. walk west of JR Hakata Station, near Sumiyoshi Shrine. Art Tower Mito (English website) – Contemporary Art Gallery in Ibaraki’s capital city of Mito. Be sure to go up the tower for great views of the city. mewe HASHIMOTO ミウィ橋本 5Fインナーガーデン – Venue for Photo City Sagamihara. Miyazaki Prefectural Art Museum 宮崎県立美術館 – Rental gallery, called Kenmin Gallery, offered for a low weekly rate. Application screening required. Located within a culture park (Bunka Koen). From Miyazaki Station, take a bus headed for Bunka Koen. 下岡蓮杖写真記念館 – Museum dedicated to SHIMOOKA Renjo, a Shimoda native and pioneering Japanese photographer during the late 19th century. His various documents and materials, vintage photos, and vintage cameras are displayed. Near Izukyu Shimoda Station. Take the Shimoda Ropeway up to Nesugata Hill. Tokyo has Japan’s highest concentration of photography museums, galleries, and exhibitions. Only one museum is dedicated mainly to photography, while a few other art museums have a significant photography department. Photography galleries are mainly private galleries representing photographers and camera makers’ photo galleries such as by Canon and Nikon. Then there are other spaces large and small which exhibit photography on occasion. Tokyo Photographic Art Museum (formerly Tokyo Metropolitan Museum of Photography) – Japan’s largest photography museum in Yebisu Garden Place near Ebisu Station in Tokyo. Note that due to major renovations, the museum of is closed until fall 2016. It will reopen with a new name in English and new URL. The name in Japanese remains the same. Photo Gallery International (PGI) – Longtime and well-respected gallery. Zeit Foto Salon – Another pioneering photo gallery in Tokyo. Galerie Sho Contemporary Art – Near Tokyo and Nihonbashi Stations. Taka Ishii Gallery – Represents Nobuyoshi Araki and Daido Moriyama. 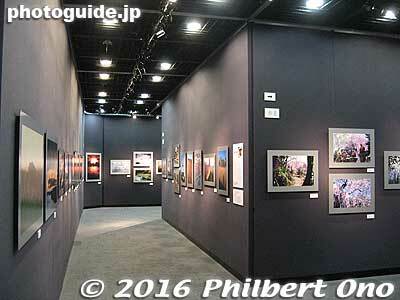 Canon Gallery Ginza – Photo gallery near Higashi Ginza Station. Exhibits works by photographers who passed the screening for a show. Gallery is part of Canon’s camera showroom and service center. Nikon Salon – Photo gallery in Ginza and Shinjuku. 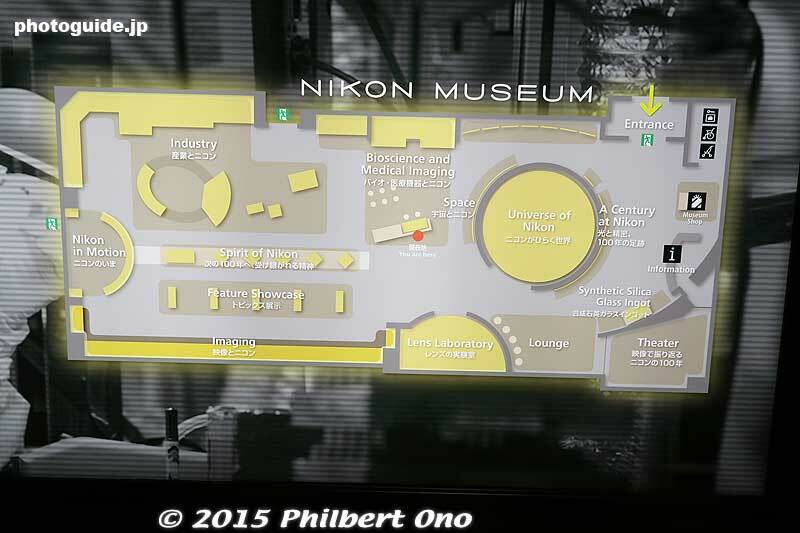 Nikon Museum – New museum opened in Oct. 2015 on the second floor of Nikon’s head office in Shinagawa, Tokyo. It is to mark the 100th anniversary of Nikon’s foundation in 2017. The swank museum has 580 m² of exhibition space to show all their products, including a showcase of 450 Nikon cameras dating back to 1948. Other exhibits show Nikon’s other products such as steppers, microscopes, and binoculars. Very comprehensive exhibits on Nikon’s history and technologies. There is also a museum shop selling Nikon merchandise like postcards and tote bags. 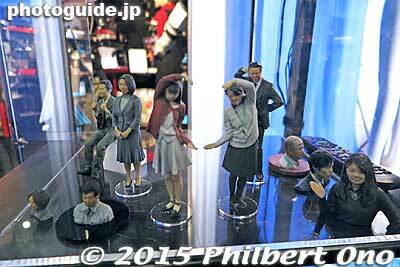 Konica Minolta Plaza – Photo gallery near Shinjuku Station’s East Exit. Although the camera maker has been absorbed by Sony, this gallery still exists. Monochrome Gallery RAIN – Fine-art photo gallery near Ikejiri Ohashi Station (Den’en Toshi Line, one stop from Shibuya). Run by a family headed by a fine-art photographer. They curate exhibitions (not a rental gallery) and represent artists. Open only on weekends. 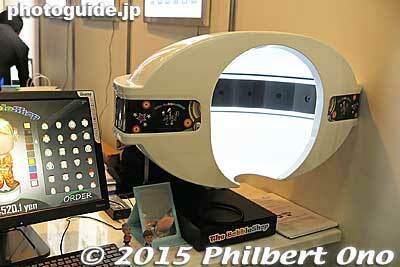 Pentax Forum – Photo gallery near Shinjuku Station’s West Exit. epSITE Epson Imaging Gallery – Gallery near Shinjuku Station’s West Exit. 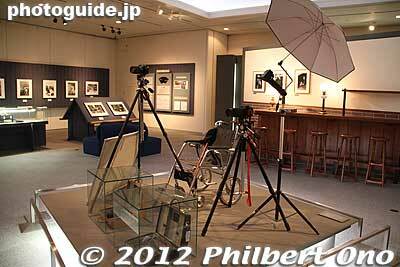 photographers gallery – Photo gallery in Shinjuku. Place M – Photo gallery run by Daido Moriyama and others. Weekends /Holidays- 12:00~22:00(last order 21:00), Closed: Mondays (if Monday is a holiday, we will close on Tuesday). Eatery near Ebisu Station with 5,000 photobooks for customers to browse freely. From the collection of Iizawa Kohtaro, a well-known photo critic. Hayashi Tadahiko exhibition room at Shunan City Museum of Art and History. Kiyosato Museum of Photographic Arts 清里フォトアートミュージアム Map – Opened in July 1995 with Hosoe Eikoh as the museum’s director. For its annual “Young Portfolio” project, the museum selects, purchases, and exhibits photos taken by young photographers (under 35) or taken when the photographer was young (in their 20s). Works by many young overseas photographers are also selected for the museum’s collection. 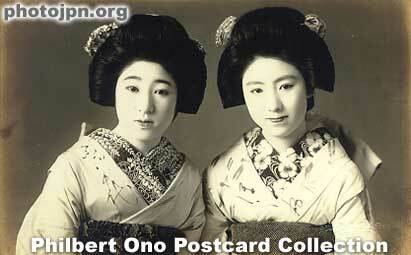 In the late 1990s, we had an English-speaking postcard collectors’ club in Tokyo called the Postcard and Paper Collectible Club of Japan founded by Jason P. Smith. It was active with regular meetings, but it soon became defunct after Jason moved away from Tokyo in the early 2000s. I joined the club and hosted the club’s website called PostcardGuide Japan – A Guide to Postcard Collecting in Japan. The website had a mix of content created by myself and a few core members of the club. Here are links to the content we had. A few pages have been updated in early 2000s, while others are outdated but still might be interesting. Year Conversion Table – Figure out what year Meiji 5 was, etc. Video below is Japanese TV program “Nandemo Kanteidan” (なんでも鑑定団) which was broadcast in August 2000 with Jason Smith showing his pierrot postcards. They appraised the value of his cards. 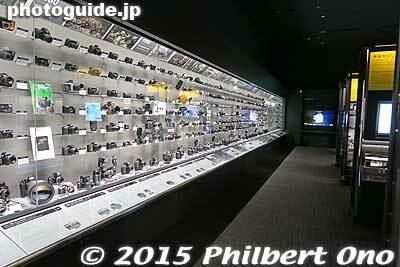 The new Nikon Museum has opened on the second floor of Nikon’s head office in Shinagawa, Tokyo. It is to mark the 100th anniversary of Nikon’s foundation in 2017. The swank museum has 580 m2 of exhibition space to show all their products, including a showcase of 450 Nikon cameras dating back to 1948. Other exhibits show Nikon’s other products such as steppers, microscopes, and binoculars. 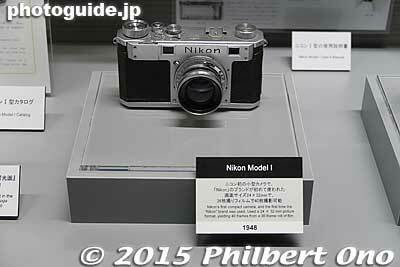 Very comprehensive exhibits on Nikon’s history and technologies. There is also a museum shop selling Nikon merchandise like postcards and tote bags. Sayoko was Japan’s first world famous fashion model active on catwalks from the early 1970s to the 1980s. There has never been a Japanese fashion model like her ever. Her makeup, her image, her aura, and Japaneseness were in a class all by herself. I’m sure that without all that makeup, she was just a plain Jane Japanese woman. But somehow her spirit made her super special. She was a great advocate of Japanese culture, making even the chawan cut (bob or bowl cut) look cool and fashionable. Sadly, she died in 2007 at age 57. The exhibition is very interesting with displays of her possessions (dressmaking sketches, etc.) from the 1970s, exquisite fashion photos of her (mostly by Noriaki Yokosuka), video clips of her on the catwalk, short films, Shiseido posters of her, and very impressive lifesize Sayoko mannequins. If you like high fashion, Japanese culture, and/or 1970s pop culture, this is a must-see. Read more about Sayoko here (photobook review). Hours: 10 am – 6 pm, closed Mon. Near Kiba Station on the Tozai subway line and Kiyosumi-shirakawa Station on the Hanzomon Line. Would you believe that the selfie stick (called jidoribo in Japanese 自撮り棒) was invented by a Japanese man about 30 years ago? The invention was registered in Japan and the US as “Telescopic extender for supporting compact camera” in 1985. However, the patent expired in 1993. The inventor got very little royalties. Too bad, he was ahead of his time. People at the time thought it would look too awkward or nerdy to be using such a contraption. So it never caught on and the inventor didn’t bother to renew the patents. In Japan, most people I see using a selfie stick are foreign tourists. However, selfie sticks are getting popular among the Japanese as well. 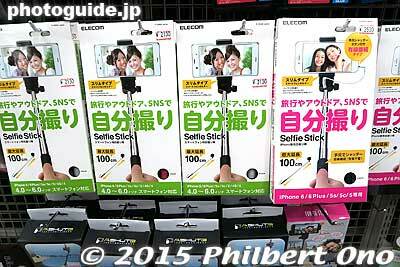 I see that camera shops in Tokyo have a large selection of selfie sticks designed for smartphones. Be aware that some museums and zoos in Japan are starting to ban selfie sticks (along with tripods). Also, in train stations (like on the Hokuriku Shinkansen Line), selfie sticks are banned because you could get electrocuted if the stick gets too close (within 2 meters) of the power lines above the train cars. Your stick can get electrocuted even without physical contact with the power lines. Just get close enough, you or your smartphone might get fried. Otherwise, use your common sense when you take out your selfie stick in Japan. Make sure you don’t hit or poke anyone. I guess fewer people will ask me to take their photos from now on. 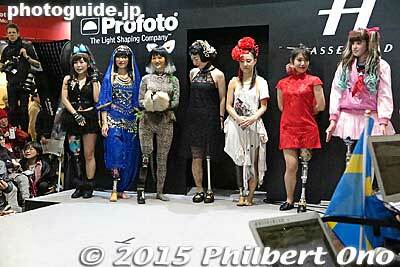 Profoto/Hasselblad booth’s artificial leg fashion show on Feb. 14, 2015. 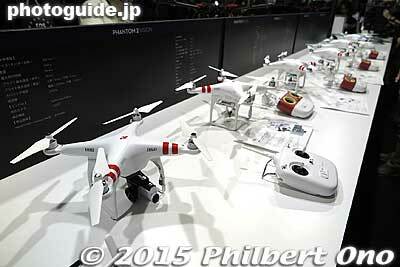 Went to see Japan’s largest camera show that is CP+ 2015 in Yokohama on Feb. 14, 2015. Good weather, no snow, and lots of people. 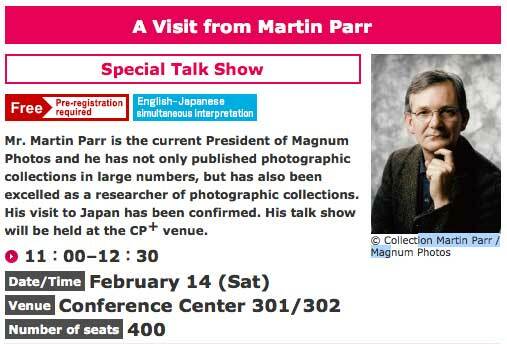 First I attended a talk by special guest Martin Parr in a large conference room at 11 am. He showed slides of his collection of photos on plates and trays, photos of Margaret Thatcher (whom he hated) on various paraphernalia, and other things. Then he showed images from several of his photo books. He’s British and basically a street photographer (besides being the president of Magnum Photos). He is always pursuing different shooting themes. One favorite theme is the beach. Although he travels the world, much of his work focuses on his home country in the UK. He pointed out that photos of mundane scenes which nobody photographs (like one of a woman filling gas at a gas station) become interesting after time. I certainly agree with this, but you may have to reach certain age before you can realize and appreciate this. He even made an “awful” photo book showing awful photos with awful book/graphic design printed on bad paper with printing mistakes. His photo book of “bad weather” photos was also opposite of what most people like to shoot (nice sunny days). He has a playful attitude and always pushing his own imagination as to what to pursue. I really enjoyed his talk and slides, but was disappointed that he did not show his photos of Japan. He has about 100 photo books to his credit. However, compared to Araki Nobuyoshi and Moriyama Daido, he called himself an “amateur” since Araki has published several hundred photo books. Perhaps he didn’t want us to compare his “amateurish” street photos of Japan with Araki’s/Daido’s. Or perhaps he didn’t want to show clichéd photos we’ve already seen. He admits that he takes lots of photos so he can chose the best ones. Most shots are not usable he said. Well, that goes for most of us. Martin talked for an hour and the last 30 min. was a Q&A session. I was able to ask him what Japanese photographers should do to become more well-known outside Japan. His answer was, “Take great photographs.” He also advised that being able to speak English also helps. He cited Kawauchi Rinko as one of his favorite Japanese photographers. When he met her 10 years ago at Rencontres d’Arles festival, Arles, France in 2004, she didn’t know anyone in Europe and couldn’t speak English well. But now she has improved her English and has friends in Europe. Another foreign person in the audience asked Martin about model releases for his street photos. Martin replied that he does not ask anyone for any model releases. “It’s not a problem in Europe or the US.” Martin was surprised to hear that it was stricter in Japan. However, I doubt that most street photographers in Japan actually obtain model releases. The chances of being sued for a street photo you publish in a book, etc., is so slim. As long it’s not for advertising or commercial purposes. Martin also mentioned that they want more diversity in male-dominated Magnum Photos. So they are looking for young Japanese photographers (especially female). So apply if you think you qualify. 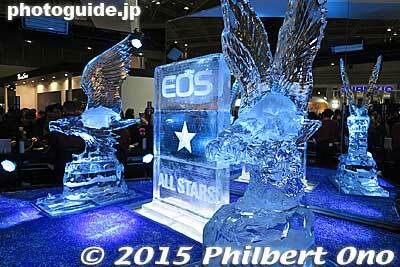 Ice sculpture of eagles at the Canon booth. It melts within a day so they built a new ice sculpture for each day of the show. 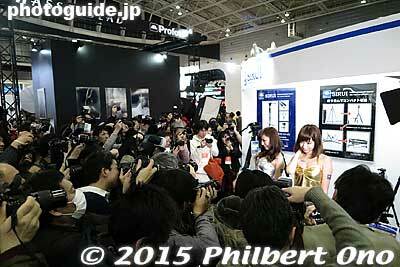 As for the camera show, all the major Japanese players were there as usual. GoPro was missing, but Chinese quadcopter drone maker had a booth strewn with their quadcopters including one that was flying tethered above a stage. Their cheapest model can fly for about 25 min. They also had a large, expensive model that can carry a Canon 5D D-SLR camera aloft. NHK was demonstrating 8K video which looked nice, but can’t really tell it apart from 4K. They should have a side-by-screen with 4K for comparison. 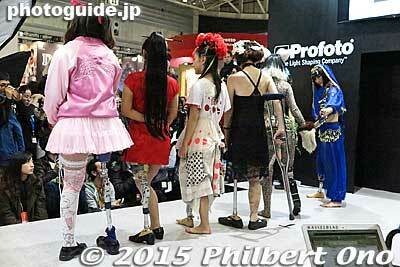 What stole the show in my mind was the Profoto/Hasselblad booth’s fashion show featuring young female amputees in a fashion/cosplay show for artificial legs. Very impressive. Hats off to the girls and the people who staged the show that was held only on the 14th. 3D capture of your face for a 3D printout. From Mutoh. 3D printing of your face fitted on a body of your choice. Costs about ¥6,000. Realistic 3D printed sculptures from Mutoh. Created from a full-length photo booth. Cost is about ¥100,000. The amputee fashion show was held twice only on Feb. 14, 2015. This company knows how to attract attention.